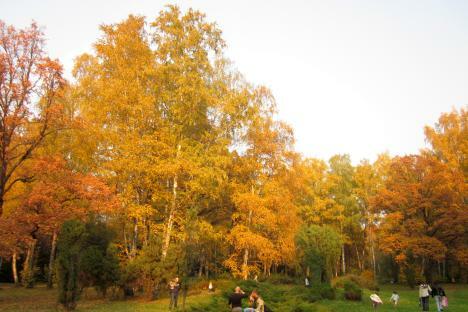 Moscow botanical gardens in autumn are just one destination Phoebe writes about. An RBTH contributor who has reported from Moscow and London, Phoebe Taplin has just written four books on the subject, inspired by her column for The Moscow News. The first Autumn volume is out now, the series is called simply “Moscow Walks.” Taplin has walked more than 5,000 miles in her explorations. She talks to her colleague, Nora FitzGerald, about the art of walking in Moscow and beyond. RBTH: When did you first realize you had a gift for walking? PT: I’m not sure if my gift is walking per se. I am not one of those people who walk round the world or complete incredible feats of endurance. None of these routes is very long or challenging, but I think they are quite interesting and unusual. I like to describe myself more as an explorer. The social element is also very important for me; I usually explore on my own, but try out subsequent versions of the route with a group and I have discovered a gift for bringing people together. It’s also true that I have always loved walking. It was a constant family pursuit from early on. My mother wrote a book thirty years ago called “The English Path” about footpaths in literature. She took my brother and me on the Cotswold Way when we were only five and seven years old. Of course, I slowed down a bit as a lazy teenager and harassed mum, but rediscovered the passion in Berlin when my own kids started full-time at school. RBTH: How are your walks different from other walking tours? PT: There is plenty of Russian history and culture in this series of walking books, but the main emphasis is on enjoying Moscow as a city in all its moods and seasons. The walks are relatively light on background information compared with the heavy-duty Soviet approach to guided tours. Instead, there are quirky details, unusual asides, cafes and markets. Beauty, interest and atmosphere are the priorities and a celebration of Moscow’s extreme contrasts. In particular, the focus on parks and semi-rural rambles makes my book is pretty much unique so far in terms of guidebooks to Moscow, certainly ones written in English. There are virtually no mentions in English – for instance – of the ‘Elk Island’ national park in north east Moscow, where several of my routes are set. RBTH: In how many cities have you conducted your walks? Which cities? Do you have a favorite city? PT: Not only cities. I have walked mostly in and around Berlin, Moscow and London, but also in India, the Caucasus and Herz Mountains, Wales and Cornwall. I have organized group walks along the River Thames, the Pennine Way, South Coast Path and other long distance routes in England. I was very happy wandering through the woods around Berlin where we saw wild boar and woodpeckers, swam in clear lakes or warmed up with glühwein in cafes. But – ultimately – Moscow must be my favorite city to walk in. It wins through sheer variety. Where else could you find constructivist clubs, domed churches, neoclassical palaces, wooden dachas, baroque golden fountains, lakes, woods and pavilions all in one easy-to-stroll-round park? RBTH: And your favorite walk in Moscow? Describe! PT: If I have to choose just one, I suppose it might be through the hilly orchards of imperial Kolomenskoe, a park in what are now the Moscow suburbs. The experience is totally different at different times of year, with drifting apple blossom and banks of tulips, golden leaves on the ancient oaks or frosty trees and mist on the half-frozen river. Moscow’s oldest inhabited settlements were here (worshipping sacred rocks in the ravines) and almost every Tsar and empress since has added to the strange palimpsest of lost, historic buildings. RBTH: Do you have a most memorable walk in Moscow, a moment in time? PT: So many! One that really sticks in my mind was a lovely day trip to Rostov Veliky in February, about 100 or so miles north of Moscow on the train. A group of us left at dawn on the express and arrived on a brilliant white, blue and gold winter’s day. We explored the old churches, had lunch in the kremlin, glanced round the art galleries and then we set off – as the sun began to set already - along the side of the huge and frozen lake Nero, fringed by upturned boats. Ice fishermen were pulling their days catch home on sledges and the feathered reeds were golden. One friend – who had just turned sixty – was so excited that she tobogganed down a snowy hill on her coat. We could already see the fairy tale towers of our destination (St Jacob’s monastery) ahead and then – as we approached – the whitewashed walls of the whole ensemble turned pink in the evening light. RBTH: What was your biggest catastrophe or funniest debacle (walking)? PT: Plenty of amusing adventures: from being propositioned by a drunken Cossack on Gzhel railway station (or another time a Georgian lorry driver who wanted to marry me) to sinking knee-deep in the marshes of the Izmailovo Park… One guy had to take off his trainers to wade barefoot through the mud. I kept trying to explain to him that it wasn’t always like this; sometimes it was even quite civilized, but he never came back. Another time we had to run away from a pack of wild dogs near a fancy dacha compound. We didn’t even stop when we got to the river, but ran right through it. It was all part of the adventure. RBTH: It seems like you take moving from one place to another more seriously than other folks. What is your philosophy of transport, or movement, and why do you know the public transport system better than most natives? PT: Walking is the best way to get to know somewhere and getting to know somewhere – especially somewhere as interesting as Moscow – is the best way to fall in love with it. Cars are the biggest day-to-day problem in modern Moscow, ruining everyone’s quality of life. They limit and confine you. For me, travelling by public transport – metro, bus, trolleybus, minibus, tram, train, boat and occasional gypsy cabs – means you are never shackled to a giant lump of metal; you can strike out in any direction and find new places to explore. Moscow’s public transport might well be the most efficient in the world, even better than Berlin where we lived before and that is saying something. RBTH: Do you ever get sick of walking? Or is it some kind of mantra for you? PT: Never. It’s not exactly a mantra, but it is perhaps a kind of religion. Moments like that afternoon in Rostov where you can feel your soul expanding (and there have been hundreds – maybe thousands of those) are seriously addictive. Occasionally (especially after a heavy night) I have had half a minute of wishing I could just go back to bed and nurse my hangover, but as soon as I get out there – especially in a group – it’s always wonderful, always worth it. PT: I once worked out that I had walked at least 5000 miles in the course of four years researching these walks (it must be more by now) so I have, in fact, have walked more than a fifth of the way round the earth. RBTH: Are you family devotees of the walk? How would you encourage other families to get their children walking? PT: My new book has a ‘kids’ stuff’ box for every walk with tips for making it fun, taking short cuts, child-friendly museums and restaurants and playgrounds along the way. Several quirky Moscow venues – like the museums of ice sculptures or of felt boots – have been hits with kids and there were four kids on the walk where we sank in the mud and they loved it! The secret is to explore, not rush. One long-term fan that I recently met at the American embassy told me that he had walked my walks every weekend with his daughter and they had always had a fantastic time. I was thrilled. As for my own family, my husband is always an enthusiastic companion when he has time, but, actually, the kids aren’t that keen on my walks any more. I would love to say that they always cheerfully come with me and have a great time, but it wouldn’t be true. I think I got them lost too many times, taking them with me on my exploratory research at weekends. They have (over the years) tried out a huge number of the routes with me, but rather reluctantly and with (to my mind) a disproportionate amount of protest. Now they are old enough to stay behind if they want, I most often let them chose to come or not and rely on my wonderfully uncomplaining walking groups for company. I love my husband and children more than anything and could never have embarked on this series of books without their help. At the same time, my walking groups in recent years also feel like an extended family. The supportive, friendly atmosphere became a very important part of enjoying our years abroad. "Moscow Walks" can be purchased online through Amazon U.K. or The Moscow News.